Okay, so this is the project that I've been working on with writer Ian Ascher and myself along with the gorgeous Colette Nelson.These are just some of the pages and photos from the book which I think is a pretty fun read myself. As this project was nearing it's deadline and Ian getting nervous, I spent many a sleepless night getting the layout together along the lettering and the art in time to get it to the printers.Also, the amount of photos that we had to go through was just incredible. 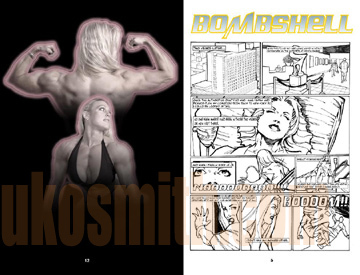 We got a CD of photos from Colette that had to be around 600 photos and having to narrow them down for the book was pretty tedious I must say.The Bombshell Comic made its debut at the Arnold Classic 2006 this month which went off pretty well. I didn't get a chance to make it down there this year, but the comic got some great critiques given to me by Ian. There are plans to do similiar projects like this in the future with Ian in which I can't wait to get them started. So if you would like a copy of your own, the book is limited to just 500 copies. You can find it in the Store section on my site. Here are just a few of the sketches I would do to get familiar with to drawing Colette.